Halfway between hairspray and dry shampoo, this spritz is key to creating insouciant, bed-head texture in an instant. Completely invisible (there’s no tell-tale chalkiness), this amplifies ‘oomph’ and creates ‘grip’ for styling with volcanic minerals and flexible polymers… and it smells like a bergamot grove. 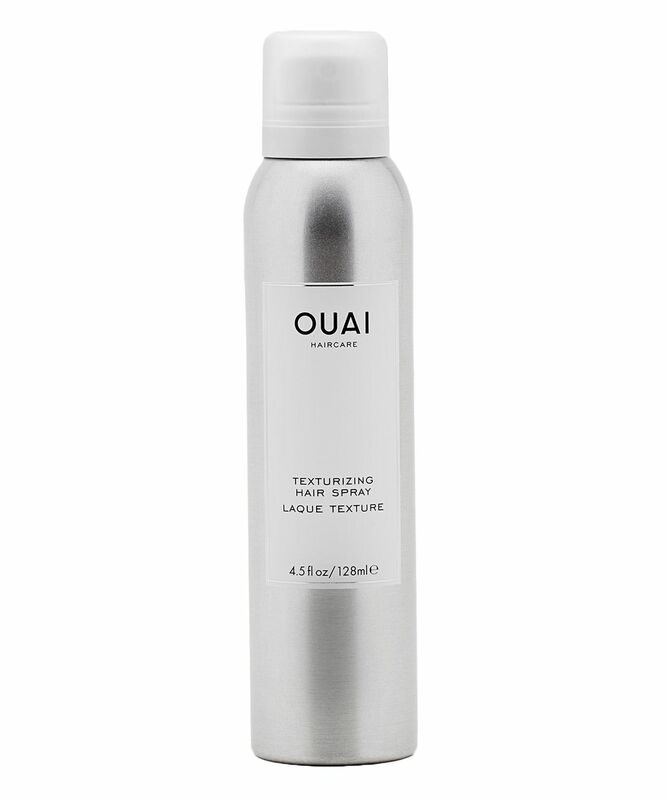 The perfect way to add some ‘grit’ to slippery hair types, OUAI’s Texturizing Hair Spray is ideal for recreating that enviable ‘French girl’ look – a tousled sexiness that exudes Parisian nonchalance. Invert your head and spray the roots to create ‘oomph’ (and absorb oil), then spray the lengths and ‘tszuj’ with fingers to achieve a separated, choppy finish. Enriched with OUAI’s ‘Smart Technology’ – a cocktail of nourishing ingredients including amino acids, tamarind seed, keratin, ama oil, hibiscus and jasmine to strengthen, enhance moisture levels, repair and protect from humidity – this refreshes, volumises and perfumes your strands with the delicate scents of Italian bergamot, rose, lily of the valley, waterlily, iris and white musk (ideal to disguise a stale, night-on-the-town odour). Shake it up. Holding the bottle 6" from your head, mist dry hair from roots to ends. For ultimate volume, flip hair upside down and spray. Jen's Tip: Mist it on dry hair and scrunch strands out with your fingers for a loose, lived-in look. Flip hair upside down and spray for instantly fresh-looking hair. Hydrofluorocarbon 152A, Dimethyl Ether, Alcohol Denat., VP/VA Copolymer, Panthenol, Tocopheryl Acetate, Actinidia Chinensis (Kiwi) Fruit Extract, Aloe Barbadensis (Aloe Vera) Leaf Extract, Hedychium Coronarium (Ginger) Root Extract, Mangifera Indica (Mango) Fruit Extract, Passiflora Incarnata (Passion Flower) Extract, Helianthus Annuus (Sunflower) Seed Extract, Glycerin, Acetyl Triethyl Citrate, Parfum (Fragrance), Zeolite, Butylene Glycol, Aqua (Water, Eau), PEG/PPG-17/18 Dimethicone, Benzoic Acid, Sorbic Acid, Phenoxyethanol, Chlorphenesin, Benzyl Salicylate, Hexyl Cinnamal, Limonene, Butylphenyl Methylpropional, Linalool, Hydroxycitronellal. This product makes my hair look way better than it has before. Full of volume, textured, and messy (in a good way). The cheaper alternative to Oribe, really gives my soft hair texture and better hold and volume, which last longer than usual. Cannot be without this. Gives that effortless look, really impressed. This is the only texturising spray I've ever used which has not gave a crunchy or dirty feeling to my hair. It really does add texture and a bit of grit to my lifeless hair, very impressed. I've always been hesitant to get the Oribe Dry Texturising Spray because of its price so was happy to settle with this. I'm not a fan of the smell but when used after I've curled my thick Asian hair, it really does give that effortless/cool-girl vibe that's very sought after at the moment. My hair doesn't tend to hold up curl very well in the humid climate in which I live but it holds up decently with this, which is impressive seeing as L'Oreal Elnett can't! Granted that it's not cheap, it's more accessible than Oribe and the packaging is gorgeous. This is the best texturising spray I've ever used.....and it smells lovely! This product is so, MEHH. I don't know how else to describe it. It's not bad but it's not phenomenal either. I personally don't like the fragrance (kinda smells like methol or medicine), but it's bearable. It gives me a little tiny bit of volume and grit to my hair but nothing impressive. I feel that this product is designed to give you that 'effortless' hair look? I mean the product definitely achieved that, because it really looked as if I had done literally nothing at all to my hair after using this lmao. Waste of money in my opinion. You're better off with using hair mousse and styling clay. So, this does do something, but it lasts for about 5 minutes...and that is just not eh..not ideal! I get more out of using a cheaper dry shampoo as a texturizing spray than this, disappointing. So annoyed this was rubbish after hearing all the hype. Seemed to make my hair more flat, and did nothing else. I had high hopes for this after reading reviews but it my experience it was awful. The smell is so overpowering and gave me a headache, the product itself left the hair greasy and did not provide any noticeable volume. So annoyed as it's not a cheap product. Do not recommend.